This Online Mentoring Community has been created for Warwick postgraduate students to give you the opportunity to get pastoral support and advice from trained PG Mentors. Our mentors range from Masters’ students to Early Career Researchers who have a wealth of postgrad and Warwick experience. This online platform is accessible to all Warwick postgraduate students, allowing you to be part of our community no matter where or how you are studying. Once you have signed up to the online platform you will be able to ask questions privately via a selected mentor, discuss your queries on the open questions page to get advice from a mix of PG students and share your experience with your PG community. Interested in becoming a mentor? Find out more and apply. Want to meet a mentor face-to-face? 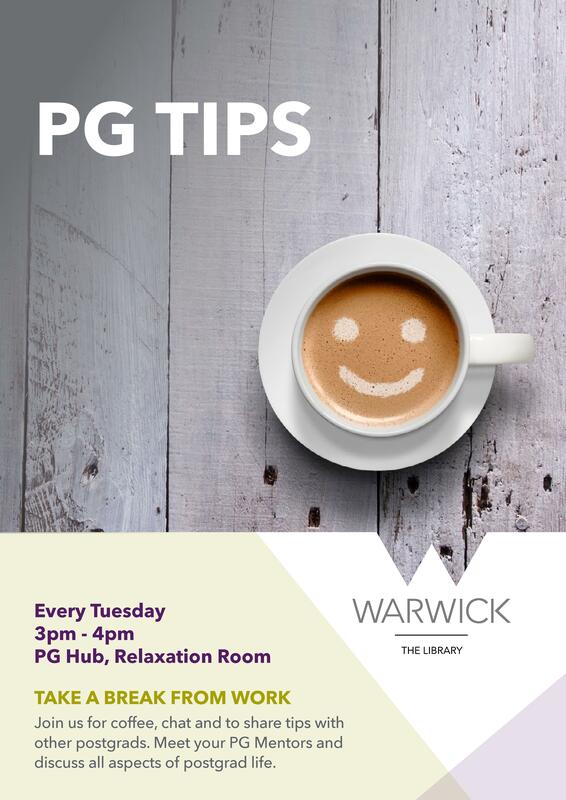 Come to PG Tips on Tuesdays 3-4pm in the PG Hub Relaxation Room to meet some of our mentors in person. Felipe and a changing guest mentor will be available to answer your questions and to have a chat over coffee and biscuits.